The image-driven firehose that is social media challenges the modern writer. I see some managing to do clever things with it, releasing aphorisms and motivational notes, and others just stupefied. Count me more often among the latter. Not long ago, writer, blogger and ace self-marketer Shannon A Thompson posted about her book teasers, single-image character bios she puts out well in advance of her book’s release. I can do that, I thought. But I couldn’t. My efforts seemed both too much and not enough, and in retrospect I think Thompson’s style wasn’t playing to my strengths. I needed a way to put forward not just characters but the breadth of my story, and my own writing style, in bits and snippets – in a spirit of play. I did have a great cover, thanks to artist Julie Duong, and my banner showed me that I could make an unusual concept work. Early one morning three weeks ago, trying to get back to sleep after waking too early, I suddenly saw these in my head. I’m no artist, but I can run an image editor enough to add borders and fonts. I took Thompson’s great idea to use stock art for my character images – it helps that they’re mostly business people, and stock art sites are full of those – but I ran them through Prisma, the smartphone app that makes people look painted, which let me image the character’s personality, not just their looks. For now they’re on my own Instagram account adobranski. Follow it and get a little literary oddness in your daily feed! This entry was posted in craft, novel, tech and tagged book marketing, book promotion, book teaser, booklife, bubblegum cards, cards, instagram, marketing, social media, trading cards on September 21, 2016 by . Less tool than fetish, and disappointing. Funded on Kickstarter, the new Freewrite is a solid, lovingly-crafted device that promises to return writers to a place of distraction-free spontaneity. 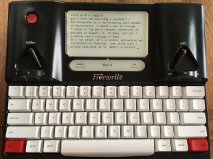 From its low-power e-ink screen to the aluminum case – with handle – to the deep-traveling satisfyingly-clicky Cherry keys, the Freewrite consciously recalls early computers, manual typewriters, and a more physical, engaged time. I love touching it. Really. Alas, none of those keys moves the cursor. “Distraction-free” writing is not a method like touch-typing, but an ideal. For some, it means paper. For others (like me), it means starting my work in a text editor, not a print-oriented word processor like Word or OpenOffice. For still others, it means gimmicky apps that literally delete your writing if you pause too long. Whatever works, right? And if it doesn’t work, you can do something else. Not on the Freewrite. For the Freewrite, “distraction-free” means, and only means, a weirdly oppressive no-turning-back mentality, like Allen Ginsberg’s “first thought best thought” warped from liberating ideal into blind diktat without recourse. You can only keep keying. You can’t go backwards, save to delete – and that has the acceleration of a Tesla, one word, two words, a paragraph whoa! You can’t go up three lines and add a header. You must go forward, only forward, like Orpheus leaving Hades. I don’t even write that way on paper. This entry was posted in essay, tech and tagged Brazil movie, ergonomics, fetish, Freewrite, Hemingwrite, process, word processor, write, writing, writing device, writing fetish, writing gear, writing process, writing technology on May 13, 2016 by . Among the characters in my new novel is a collective of former package-delivery drones that, after a war, evolved themselves into a taxi service for their damaged city. From the earliest drafts, I saw them as small flying saucers, with only a central trunk/harness to carry goods or a seated cross-legged person. It took a little time before I saw the plot and character possibilities of robots without hands or appendages. It meant that they had continued to evolve themselves to depend on people, both as customers and even as mechanics, like Thomas the Tank Engine. I also gave them a limited vocabulary of green and red lights, suitable for bargaining over fares, but akin to the radiation-wounded Christopher Pike on old Star Trek. This made for a stranger, more labored interaction, but one familiar to anyone who has set a digital device. This entry was posted in essay, novel, politics, tech and tagged androids, culture, fiction, future, futurism, robots, sci-fi, Science Fiction, social media, society, technology, writing on December 2, 2015 by . NaNoWriMo 2015 Day 02 – 3775 words. I think it is the most I have written in one day ever. I had an outline but a lot of patches that I found promising ways to fill. Many more distractions today than yesterday, including house painters, so I worked very late at it, but I am pleased to have beaten the goal on this biggest single day of my schedule. One good thing about being a slow blogger is that you don’t have as much to undo. At several different points this past year I was convinced I had found a way to use a small touchscreen device – sometimes a tablet, sometimes my phone – in a way that helped my writing more than the extra work it took to use. I even wrote posts but never finished them. None of my tools survived so much as a week. While the hardware form-factor was pleasant, the compromises of using apps designed to take over the screen and only open one document at at a time (with no local storage) was too inconvenient for long-form writing. That said, I had some fun. My most noteworthy creation was to take a hinged keyboard for a tablet, and replace the tablet with plexiglass and poster-hanging putty, to make a rest for the phone. It worked well enough that I know in a pinch I could do remote work on it at length. Despite its appealing 1970s-tech look, I wouldn’t want to. 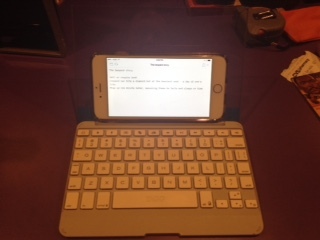 This entry was posted in essay, tech and tagged iPad, phone, portable work, smartphone, tablet computers, tablets on November 3, 2015 by . For grabbing ideas when inspiration strikes, or trying to make a long wait into useful work-time, an Internet-connected smartphone is a great device. It’s already with you. Word-processor apps still aim for completeness of function, however, which makes them labored to start – just opening a file can scare a good idea out of one’s head. Text editors are cheap and light, but even for printing, text needs layout and formatting. If you use Markdown syntax, you can quickly reformat any text into any electronic publication format. Markdown, invented by John Gruber, is a set of punctuation-mark tags that tell an app reading the file how to format and display text. With Markdown you can tag your notes with headings, emphasis, images and links, all using single or paired punctuation marks. Asterisks (*) and underscores (_) around a word or phrase of text emphasize that text. Begin a line with one or more hash marks (#) to make it a heading. One hash mark is Heading 1, two is Heading 2, etc. Begin a line with a right angle bracket (>) to indent it. Other simple marks indent, make formatted lists, and insert links and images. There are variations on Markdown for technical needs, but for a prose writer, Gruber’s original syntax is easy to use. Gruber’s own command-line converter, written in Perl, will turn Markdown text into HTML. Many other text editor apps on all desktop and mobile operating systems read and convert Markdown. In another post, I’ll discuss Pandoc, a quick document converter that can turn Markdown text into any current text or publishing format. For more details, visit Gruber’s site Daring Fireball. Markdown is designed for prose writing. For a script-writing text syntax, look into Fountain. *If you have an option for encoding, which tells apps how to handle accented characters, most English-language writers should use UTF-8. This entry was posted in tech and tagged Daring Fireball, HTML, John Gruber, Markdown, markup, productivity, smartphone, tagging, tags, text, text editor, writing on August 14, 2015 by . A friend recently told me that the old TV series The Six Million Dollar Man, about a grievously-wounded astronaut fitted with human-looking but superpowered prosthetics, was being rebooted. I vented about this a while — I have issues with the constant readaptation of the recent pop-culture past, driven by the marketer’s fear of an unsure product — but a recent panel I had seen at the World Fantasy Convention put me in a kinder mindset. The panel discussed the rise in European horror fiction after World War 1. Fiction helps us process the world (to a great degree, scientists now think), even the horrors of war, if it can address it. Even today, Outside the Wire’s Theater of War presents Sophocles’s Ajax to communities vulnerable to PTSD. In the US after the Civil War, and in Europe after World War I, horror stories helped society work out the true horrors they had seen and still saw, the desolation wrought around them, and the wounded disabled survivors. Because of our improved ability to save the lives of the grievously-wounded, our 21st-Century wars are increasing both the number of young disabled people and the public’s frequency and depth of engagement with prosthetic devices. There’s things to say about that, well-suited for telling through a Steve Austin figure. This entry was posted in essay, tech and tagged ajax, culture, cyborg, empathy, fiction, horror, interfaces, narrative, prosthetics, soldiers, steve austin, technology, the 6 million dollar man, the six million dollar man, theater of war, veterans, wounded soldiers, x-prize on November 26, 2014 by . I’m wearing my technology hat today, with a productivity column inspired by some weekend discussions. If you conduct your work and home lives from the same computer, it’s hard to keep them apart. Your home office or studio, carefully landscaped free of distractions, hides its biggest time-sinks on the same screen as your work. It’s hard not to “pop into” Facebook, hard not to pay bills or label vacation photos, when work grows dull — but even a small distraction can cost you a half-hour of good focus. Of course you could deactivate your Internet, but then you lose a vital research tool and regular backups to cloud storage. And the family photos are still unlabeled. This entry was posted in tech and tagged collaboration, collaborative tools, computer, computing tools, life hacking, lifehacker, logins, multiple logins, productivity, technology on May 1, 2014 by .